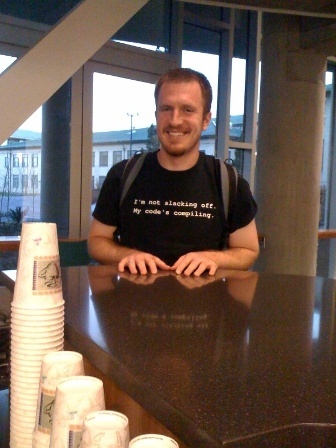 7:05 am, Nov 18 2009 – this was our first official customer at our new location at CMU’s Gates and Hillman Centers…so much for a soft opening! Thank you to all who stopped in and tried our coffee and food – it’s only going to get better and we are totally excited to be a part of the CMU community! Thank you friends who showed up bearing hugs and well wishes. I was overwhelmed by your support. Thank you loyal Tazza D’Oro customers who ventured over to CMU to see us then went back to Highland Park to see us there. Tazza D’Oro baristas…OMG, you were amazing today – thank you and thank you for being such a big and important part of our new venture. To our Tazza D’Oro crew in Highland Park – your endurance and patience thru this whole journey is much appreciated – thank you for keeping it all going and being such great mentors to our new kids. Jennifer is claiming on her Facebook page that this day did not kick her a**. I didn’t think so either until I had a glass of wine!!! Day 2 – yeah! Amy, Congrats on the opening of your CMU location! Hope to see you there soon! This is a little slice of heaven you have down here. So glad I can get the best cup of coffee in ALL of P'gh right here on campus. Best wishes. Jay, thanks for your generous words. We are totally excited to be in the Gates Center and to finally have the coffee and espresso flowing!